My 10-year-old son, C, who is in 5th grade, has read the entire Origami Yoda series by Tom Angleberger. 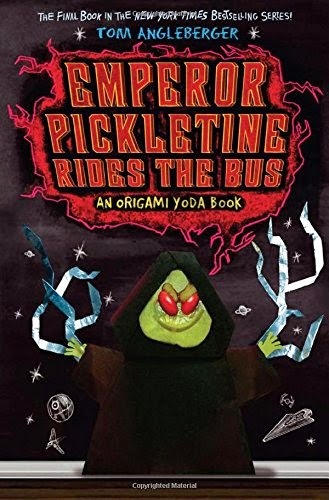 At the end of 2014, the final book, Emperor Pickletine Rides the Bus , was published and he read it within just a couple hours of receiving it. Following is his review of this book. I read the book Emperor Pickletine Rides the Bus by Tom Angleberger. It is a very good book about a field trip to Washington D.C. It is the 6th and final book in the Origami Yoda series, which is about a Yoda puppet that can supposedly use the Force. The main character in this book is Tommy. He is a seventh grader who is very nice and is also friends with Dwight, the maker of Origami Yoda. He makes case files about Origami Yoda. The story is told by many kids on the D.C. field trip. Tommy comments on each story and tries to figure out if Origami Yoda can really use the Force. Everyone thought the trip would be so cool, but there is a no origami rule. So everyone tries to find out how to have a field trip without any of the Star Wars origami. But Harvey had sneaked on an origami Emperor Palpatine called Emperor Pickletine. Of course, his face was a pickle. Then Dwight folded an Origami Yoda out of a green fruit roll up called Fruitigami Yoda. Fruitigami Yoda tells the kids to make things out of their food too. During the field trip, they visit the Air & Space Museum and then they head home on the bus, which turns into an adventure too. My favorite part of the book was when they threw the paper airplanes in the museum. I liked it because it was funny and had funny illustrations. The whole book has illustrations that make it even funnier. I would recommend this book and the whole series to anyone who likes origami and Star Wars. I like the author because he has really funny things happen to his characters. If you want to read this, you should definitely start with The Strange Case of Origami Yoda . This review was written based on a copy of Emperor Pickletine Rides the Bus that we received from the publisher in exchange for an honest review. This post includes Amazon Affiliates links.